Singer Slim Whitman has died at the age of 89. If you were alive in the late 1970s-early 1980’s you would know who Slim Whitman was. They were constantly playing a commercial back then for his buy through television only album “All My Best.” Slim Whitman had some hits in the 1950’s and 1960’s. He influenced a number of other artists including Beatle George Harrison. He was bigger in Europe and especially in Britain than he was in America. I was working country radio at the time. We were sent several gratis copies of his LPs. His music did poorly on the country charts. People didn’t even care to claim giveaway copies of his records. Eventually, high schoolers enjoyed a very short lived fad about his songs. We were finally able to get rid of the records. 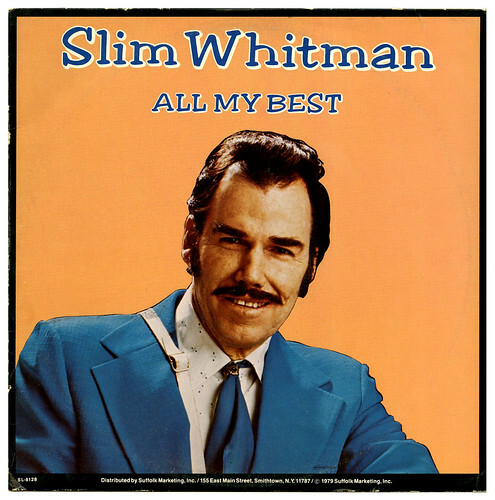 I was one of those high schoolers and I still have my Slim Whitman “All My Best” album. Its been at least a couple decades since I’ve played it though. Maybe when I get home from holiday I will..